Tide v. Yakima Reds for final playoff spot! 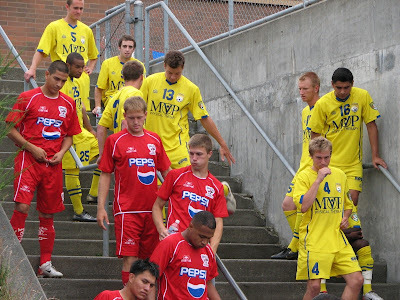 Before the 2007 Tacoma-Yakima match. Tacoma Tide FC have earned their second straight 10-win season in the Premier Development League. In 2007 10 wins was enough to get the Tide into the playoffs. This year we'll have to wait until after tonight's 7:00 PM match with Yakima to know if that also holds true for 2008. When the Yakima Reds take the pitch with the Tide tonight at Curtis High School they'll be facing a must-win situation if they hope to make the playoffs. If the Reds can win they'll knock Tacoma out by virtue of a season sweep of the Tide. If Tacoma can draw or win, the boys in yellow will not only stretch their home undefeated string, but they'll make the playoffs and Yakima will be out. Match previews in the Tacoma News Tribune and Tacoma Weekly. 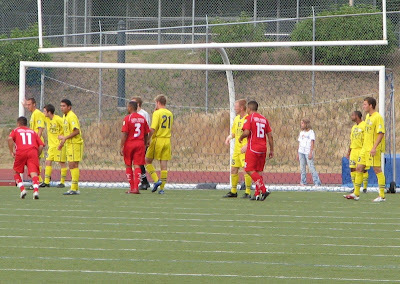 Yellow and Red face off in last year's rivalry match. These two clubs have never really liked each other. The matches in Tacoma have always included cards of various colors, including red. Last season the Tide qualified for the playoffs with a few matches to spare. How did they do it? A 5-0 thrashing of the Reds. This year Yakima has rebounded with a fine campaign and with some very big road wins. The Reds recently went up to BC and pulled off a sweep of Vancouver and Abbotsford. Something's gotta give tonight. Will it be the Tide's long (18 matches and counting) home unbeaten streak, or will it be Yakima's chance to return to the playoffs? by GOALTacoma on 7/19/2008 @ 3:37pm The weather's great! See you there, soccer fans.